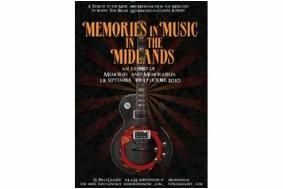 Memories in Music plans a celebration of pop, rock and blues in the Midlands | What Hi-Fi? It's part of a charity event to be held at St Pauls Gallery in Birmingham to raise money for Macmillan Cancer Support and Task Brasil, an organisation that helps abandoned children living on the streets of Brasil. Scheduled to take place from September 18th-October 17th, many memorable names associated with the Midlands' rich musical heritage have already pledged their support. These include Steve Gibbons, Dave Pegg, Ric Sanders, Trevor Burton, Carl Palmer, Steve Winwood, Hartley Cain, Ray Froggatt and Bev Bevan. They'll contribute photographs, gold and platinum records, stage clothing and instruments from their personal collections.